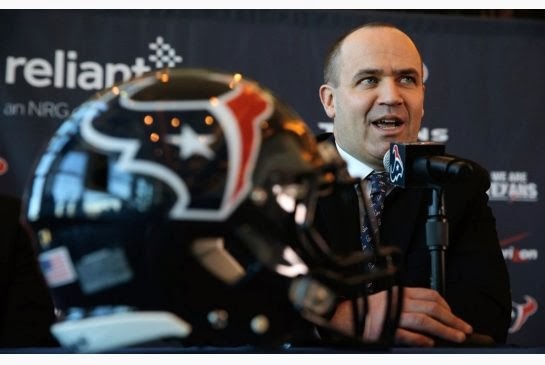 HOUSTON – Former Penn State head coach and New England Patriots offensive coordinator Bill O'Brien was named the third head coach in Houston Texans franchise history by owner Bob McNair, chief operating officer Cal McNair and general manager and executive vice president of football operations Rick Smith, it was announced today. O’Brien, who has 21 years of coaching experience at the college and NFL levels, spent the last two years leading Penn State to a 15-9 record. He was the Bear Bryant, Maxwell Football Club and ESPN National Coach of the Year, as well as being named the named the Big Ten coach of the year by the media and coaches following his first season at the helm despite working under extraordinarily difficult conditions. In O'Brien’s first season at Penn State, the Nittany Lions overcame heavy NCAA recruiting sanctions, the transfer of several key contributors, a four-year postseason ban and the negative attention that came with it to post an 8-4 record. O'Brien also served as offensive coordinator and directed a unit that averaged 437.0 yards per game in conference play to the lead the Big Ten and produced the conference’s top rusher, receiver and passer. O'Brien returned in 2013 to lead the Nittany Lions to a 7-5 record and upset wins against 18th-ranked Michigan and 14th-ranked Wisconsin in the season finale. Prior to taking over at Penn State, O'Brien helped lead the New England Patriots to a pair of Super Bowl berths in his five years on staff with the team. From 2009-10, O'Brien served as quarterbacks coach with the Patriots before adding the duties of offensive coordinator in 2011. With O'Brien directing the offense in 2011, New England led the AFC with 32.1 points per game and ranked second in the NFL in total offense (428.0 yards per game) and passing (317.8). Quarterback Tom Brady ranked second in the NFL with a career-high 5,235 yards passing and wide receiver Wes Welker (1,569 yards) and tight end Rob Gronkowski (1,327 yards) both set career highs while ranking first and second, respectively, among AFC receivers. Gronkowski also set an NFL single-season record for tight ends in 2011 with 17 touchdown receptions. Brady was named NFL MVP with O'Brien as his position coach in 2010 after throwing for 36 touchdowns against only four interceptions and a league-best 111.0 passer rating. O’Brien joined the Patriots’ staff as an offensive assistant in 2007 and was promoted to wide receivers coach in 2008. He began his coaching career at his alma mater, Brown University, in 1993 as a tight ends coach before serving as inside linebackers coach in 1994. O'Brien spent the next eight years at Georgia Tech, rising from a graduate assistant position from 1995-97 to assistant head coach by 2002. He coached the Yellow Jackets’ running backs from 1998-2000 and was offensive coordinator and quarterbacks coach in 2001. From 2003-04, O'Brien served as the running backs coach at Maryland before taking over as the offensive coordinator and quarterbacks coach at Duke for the 2005 and 2006 seasons. Born in Dorchester, Mass., O'Brien grew up in the Boston suburb of Andover and played linebacker and defensive end at Brown from 1990-92. He graduated with a double concentration in political science and organizational behavioral management in 1992.